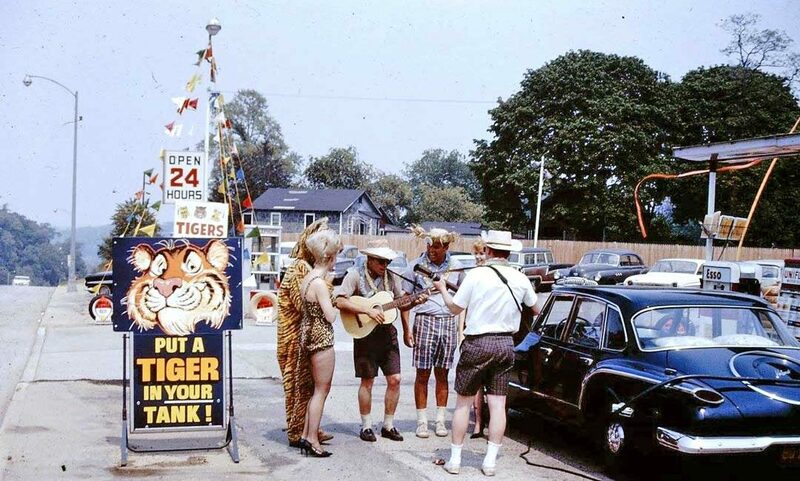 To celebrate Number 200 of the Four Fun Friday Kodachrome Car Photographs series we have chosen a set of special images to share with you of the Esso Tiger and band entertaining motorists while filling up at Humble Oil Co. stations. In the early-1960s Humble spent millions of dollars on a new advertising campaign to promote its Esso “Extra” premium gasoline blend. Researchers working on the program found that the average American responded favorably to the use of animals in advertising. Later a clever advertising copywriter working on the project named Emery Smith came up with the “Put A Tiger In Your Tank” slogan and the tiger was chosen for the mascot to promote the sale of the high test fuel. After the introduction to rev things up a bit more Esso came out with tiger stickers and toy tiger tails that attached to a cars fuel filler and ended up selling 2.6 million of them. The new campaign ended up being such a big hit that Time magazine in 1964 declared it to be “The Year of the Tiger.” View a video of one of the Esso commercials (below) released at the time to see the Tiger cartoon character in action. Share with us what you find of interest in the images found via This Was Americar. You can take look back at all the earlier posts in the Kodachrome Photographs series here. This entry was posted in Auto photos 1946 - 1965, Gasoline stations, video and tagged Esso, Esso Tiger, Humble Oil Co., Put a tiger in your tank. The Esso Tiger was inspired by Kellogg’s “Tony the Tiger” who was featured in the marketing of their “Frosted Flakes”. Not only did Tony inspire the oil company he also appealed to kids. I remember having to run a counter campaign at home in order to keep our youngsters away from the pre-sweetened cereal. Don’t tell me you later out out a hit on Captain Crunch to keep him away from your kids! Unverified rumor…Captain Crunch was inspired by Captain Kangaroo, who was neither a Captain nor a kangaroo. Even as a kid I knew commercials were, well commercials. What a horrible way to make a living for the woman and the person in the tiger suit. Quite tame compared to the way women demean themselves today in music videos, other forms of “adult” entertainment. That was a kinder, gentler time, to be sure. Remember when it didn’t matter which side of the pump you pulled up to because the hose could reach anyway. SECOND PIC: Does anyone know what the dark car on the left, over the guy’s shoulder, is? At first I thought VW, but the front fender sweeps back to gradually and then I thought MG but the hood appear too high. Maybe a 30’s Ford Hot Rod? MIKE CANFIELD: I agree about the costumes in the FIRST PIC. I feel sorry for the poor woman being ogled by customers in that bathing suit. What a way to make a living, indeed. She must have felt the same way because by the second picture, she had scrammed. I am thinking that is a Mercedes 300 Convertible. Looks like a Mercedes to me too. It looks like a Mercedes 170 S Cabrio to me. Possibly a patrician Mercedes but I would also like to nominate a plebian 1954? Singer roadster. Very similar profile. I don’t know about the hood (on the sports car), as they’ve got it folded, but the bonnet height looks OK for an MG TD or similar. It could be an early post war Mercedes, or even a Triumph Dolomite. It’s hard to tell at the distance. Dragging the hose across the trunk? Sacrilege ! You were supposed to hold the hose in your “off” hand while gassing up the vehicle so no part of it touched the car. If the hose was long enough, you could run it on the ground behind the car! I always ran it under. In the lead photo there’s the black ’60 Valiant V-200 up front. Pulling out o the station, a likely ’59 Impala of some sort, Behind the phone booth could be an ivory ’58 Cadillac, a grey ’58 Chevy sedan, probably a Biscayne or Delray, then a few over, a black ’56 Mercury Monterey Wagon, a ’49 Buick Super sedan, a ’61 Olds Holiday Coupe…it appears to be a bubble-topped 88 or Super 88 rather than that of the similar but more angular roof of a 98. The last one on the right, a wagon in grey, could be a ’59 Ford with its downward curve in the upper corner but the lip over the tailgate suggests a ’61-’63 Buick Special, Olds F-85 or Tempest with the standard one piece, non-retractable window. Good catch with the gray beach-wagon in the upper right. Don’t think it is either a small BUICK or OLDSMOBILE, 1961 to ’63, as they had a three-part rear window. The PONTIAC Tempest had a single rear window for ’61 through ’63, but it doesn’t appear right. The “thick” roof with “over-hang” above the rear window doesn’t look correct either for a 1959 FORD, but the back-up light and stop light look right. After writing all this I don’t have a clue what the vehicle is ! To enlarge this picture , I “saved” to “may photos,” and then enlarge it to get a better view. I think it’s a 59 Ford wagon. That looks like the backup light above the taillight. AML and Ernie, though initially the F-85 wagons had the retractable window as standard equipment…and that’s all that’re pictured in their brochures, apparently a more basic model was made available with a fixed window and you can find a number of them that way in a Google image search. Anyway, the ’59 Ford was easily brought to mind because of what seemed to be the backup light above the taillight, despite the fact the ’59 Ford does not have a lip over the rear window, as the one in the photo does. But what if the “backup light” is just something else interfering with our view of what would be a slim fin? Because the ’57 Ford wagon has a transom window just like the one pictured…and a lip over the top…again, as in the picture. Also, its taillight is mounted a tad higher than on a ’59 and is red all the way to the edge, unlike the ’59 taillight. The tail lights and back end of the car match that of a 1961 Oldsmobile Dynamic 88 Wagon. But not the Olds F-85 Wagon. So that appears to be what make it in fact was. I believe the gray wagon is a 1957-58 Ford. ’59s had less of a lip on the liftgate. My how times have changes. In the lead photo, the Valiant is being filled, against the fence is a 1961 Olds 88 hardtop, 1949 Buick Super, 3 port holes, and a tired looking 1956 Mercury wagon. While I vaguely recall this sales campaign, What also helped was Pontiac’s introduction of the GTO. And in `65, Pontiac gave away a gold GTO in their ‘tiger’ promotion, as well as had ads showing a tiger pelt across the hood of a GTO. This all only added to the youth-oriented atmosphere in so many things during that time. Remember, the Beatles also came here in `64! Hi Will, times sure have changed. Can you imagine the PITA flareup draping a tiger pelt across a car hood today? Horrors! My buddy’s dad bought one of the first GTOs and it came with U.S. Royal “Tiger Paw” tires. In the second photo, the black open roadster on the left somewhat resembles an early-‘50s Mercedes 170S but the hood appears to be a bit lower than the MB’s, though the fender shape and chrome trim seem a good match. Yes, good spotting. Might also be a 220. Frank, thanks, the 220 is a good suggestion…and might better explain the apparent small streak of chrome on the top of the fender. I can hear it now, “yeah, mom, I got the job”, never telling her it was the ESSO tiger. If I saw these people coming over to serenade me, I’d be out of there, the heck with the drinking glass. Looks like the Riviera driver, getting ESSO Extra, wants no part of these shenanigans. 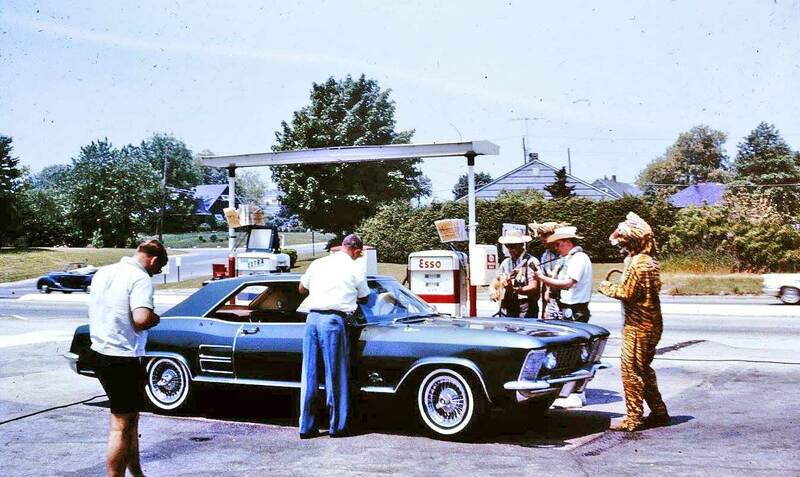 We had Humble, then ENCO in Wisconsin, had all the same promotions, but my old man was a “Standard” guy, always got gas at Standard ( or Chevron) but rarely an ENCO., even though, I believe ESSO was part of Standard Oil, but never got the tiger stuff. That Valiant, a ’61(?) looks pretty new, and nobody manning the pump handle with no auto shutoff. A gas puddle was always eminent. I read, Kellogg and ESSO lived in harmony with the tigers for years, ( probably through kickbacks and slush funds) and being one of the most popular breakfast cereals at the time, it no doubt helped sell a lot of gasoline, and ESSO knew it. EXXON retired the tiger in the 80’s, but returned the tiger in the 90’s, and that set off a lawsuit, claiming the unnamed tiger image was selling food, not just gas. A judge threw the case out in 1998, but Kellogg still persists, apparently. I had to walk past an ESSO Station on my way to Junior High (remember when kids walked to school) and I had to stop in one day to pick up a Tiger Tail. It looked pretty cool hanging out of my blue three ring binder! It’s a promotion, same as a radio station remote at an auto dealership or a furniture store, nothing more, nothing less. Probably just for the day or the weekend. Say “S. O.”, now say ESSO. Yes, part of Standard Oil. In “71 and “72 working at an EXXON we gave away green tumblers or steak knives, customers choice. Both Summers regular was 32.9 and premium was 39.9 full service only. I remember gift stamps, it took 250 books to get a color T V or a registered dog. Mom made us get gas and other large purchases on double stamp day. To get our business the gas station would send his Jeep and plow to do our driveway. Early 60s valiant.i think Chrysler claimed that it’s styling was inspired by Italian body styles,i think it would have fit right in the movie “pink flamingoes” starring divine. The tiger and esso /exxon decals were used on Indy racecars like the Watson roadsters and Lotus-Fords as part of the ad campaign. I remember getting free Enco glass tumblers at the local gas station, and I still have them! I suppose taking a tiger’s advice for how to fuel your car makes as much sense as for how to feed your children. The choice of which gas to fill your stations’ underground tanks was based on cost of transport and other logistics, not “special” ingredients and formulation. It was big news in New Jersey and New York, with reporters following tankers to film this middle-of-the-night heresy. And I saw it happen myself in the LA area, when unmarked tankers would visit different dealers dispensing identical fuel. The Valiant has to be one of the most recognizable cars ever. Shell still tries to justify the higher price of their gasoline by citing additives they put in that others don’t. I guess when you have that much competition as their is in the gas industry, you will clutch at straws to come up with something that puts you above the others. Back in the late sixties/early seventies I worked for Slauson Auto Parts doing valve jobs (among other things). And I can tell you for sure, Shell put additives in their gas that no other gasoline had. Every set of heads that came in for a valve job from the Shell stations had all this pink fuzzy carbon build-up on the underside of its valves and in the intake ports. Heads from other stations had the standard black oil crud, or grey lead build up, but nothing as outrageous as that pink fuzzy stuff. It made you wonder how those engines that ran Shell gas even ran. At the machine shop, we’d look at those heads from the Shell stations and just shake our heads. When I was in school, looked forward to Fridays…when I was working, looked forward to Fridays….now retired, and thanks to you David, I still look forward to Fridays ! These photos are such a hoot, and shows just what a simple, innocent bunch of folks we (mostly) were back then. Thanks again ! I was employed for 32 years in a petroleum refinery. Part of my responsibilities was tending the gasoline truck loading facility. Most of the major service station outlets, Shell, Mobil, Texaco, etc. had their own additive system in place on the loading rack. Each driver carried a key card that was coded to tell the automated system which of the additives to inject into the gasoline they loaded. The transport may not have the brand name on the outside, but the gasoline was delivered to the proper retailer with the proper additive. The gasoline may come from a common tank, but the ‘magic ingredient’ was different for each brand. My apologies, David. My internet hiccuped trying to post a reply and it ended up going in twice. Atlantic stations had Red Balls for your antennae. And Gulf had a pair of horse shoes that you could stick on your trunk. I believe that the words ESSO stood for “Eastern States Standard Oil” and the company came about after the big national company Standard Oil was broken up into numerous smaller companies back in 1911. Among them were such oil companies that would eventually become known as Chevron, Mobil, Arco, and Enco. The parent company of Enco was called Humble Oil and in 1959 they merged with ESSO. The problem however was that ESSO was only allowed to be legally sold in the East and in some of the Southern States most of which were located on the East Coast, so in 1973 they decided to create a new company called EXXON that was legally permitted to be marketed nationwide. I myself far prefer the ESSO name to that of the rather bulky EXXON name and like many other readers remember it well along with its popular tiger mascot. ESSO is still marketed in many other parts of the world however, but it is indeed a pity that it is now only a faded memory to those who are old enough to remember when its colorful sign was omnipresent for all those living near the Atlantic Ocean. Yes, I do believe that when the Standard of New Jersey first became independently organized in 1911 that the chosen name of ESSO was in fact derived from the two first letters of Standard Oil (S-O). But what happened was that when other newly formed oil companies came into existence as a result of the court mandated breakup of Standard Oil, bearing names such as SOOHIO, SOCONY (which later became Mobil), SOCAL (now Chevron), and KYSO (Kentucky Standard Oil), ESSO which was then being sold in several eastern states, simply became known as Eastern States Standard Oil which was an accurate geographical representation of its initials. After Standard Oil of New Jersey merged with Humble Oil in 1959, they did try to expand the ESSO name in the Midwest but ran into opposition from other Standard Oil affiliated companies, so first they created ENCO (which stands for Energy Company), and eventually renamed their corporation EXXON which allowed them to sell a single brand nationally. So I hope that clears everything up. SOCONY = standard oil company of New York. That does sound logical, but was there ever a company with the name Eastern States Standard Oil? Google search does not come up with one. OK,when you switched from brand x to say shell or esso did you notice any difference in how your car performed? If you happened to open up the engine were the insides unusually cleaner than an engine with about the same mileage? Hi Chris, I drove semi’s for 35 years, never a fuel tanker, well, once, it wasn’t for me, but I knew a couple of tanker drivers, and the tank farms where they got fuel, had like 3 or maybe 4 suppliers, and all the trucks got their fuel at the same place, whoever their broker got the best deal from. While there may some merit to the 3 or 4 companies putting some kind of additive to their fuels, in all my years of driving, and literally tens of thousands of gallons used, I can honestly say, save for contaminated fuel, I’ve never known a difference in any gas or diesel brands. Gas is gas. I still own one of the tiger tails to be hung out the gas door. As a kid in Seattle, during the Tiger promotions at our local ENCO station, we would ride our bike over there and get all kinds of free “stuff”! Thank you for your inpu r. Arbiture. I think consumer reports investigated this.concluded it was all malarkey,and you can still buy marvel mystery oil at the parts store. Nice Valiant in the top photo. My great Aunt Luva had a lima bean green ’60 Valiant. About 5 years ago, my brother bought an unrestored 1922 250cc Soyer (motorcycle) with only one owner. Its original purchaser had used it up until the 70s. It had an Esso tiger tail with the ribbon overprinted for the 1966 World Cup (football/soccer) attached (it still is… ’66 was the last year England won the World Cup) – If photos could be attached to these comments, I’d post one of it. – The original owner gave up riding and stashed the bike in his shed. Later, some years after the old man had died, his family sold it. They remembered him putting the tiger tail on it back in the sixties. If I remember correctly ESSO used to give out tiger tails attached to the filler pipe andhung out the filler door.